Question: Pick a character form a book you are currently reading or have just read and us about him/her. I just finished reading Gena Showalter's The Darkest Secret and I loved the character of Strider. (Even though this was Amun's book) I had no interest in him in the previous books and was even annoyed that he will be the hero of the next Lord of the Underworld series but in this book he was hilarious and multi dimensional. Strider is the keep of the demon Defeat. He must win at everything. We also got a peek at who his true love will be and it is going to be fantastic and quite challenging for our boy. Question: Do you have anyone you can discuss books with IRL? Tell us about them. I talk to several bloggers through emails about books....Tiger from All Consuming books is my go to person for that, also Julie - My 5 Monkey's is someone who I discuss books with but IRL I would say my husband and my friend Sherry. My poor husband is the reason I started blogging in the first place. I knew I was talking about books too much when one day I was discussing the Black Dagger Brotherhood with him and mistakingly said Z & Mary and he said "isn't Z with Bella??" No husband should know that!! I talk to my friend Sherry about books (and movies/TV shows) several times a week. We don't always agree but I love our debates or even better when we do agree and have 2 hour discussions about what we loved or hated about a book. I think it's tough to talk about books particularly if you're an adult who reads YA, or if you like PNR/UF. As big as it is in the blogosphere - it doesn't seem to have made it into the mainstream so people look at you weird when you read those genres. Thanks for stopping by and if you're interested I have two contests running through Sunday. *Win Enclave by Ann Aguirre - You have three chances to win with this contest since I've teamed with my pals The Book Faery and Tiger from All Consuming Books. Leave a comment and I'll hop back!! There's lots of great people to talk to about books in the blogiverse. I'm your latest follower and would love for you to visit my site when you get a chance. I wish I had people to talk to like yours well not that I don't anyone to talk to about books it's just out ideas about books clashes. ah you are too sweet, but I love finding out other books by bloggers or discussing them.I agree no husband should know the difference between BDB & Twilight. LOL I am like that with my niece , her and I can go on about BDB , Dark Hunters. Hopping through! Ha ha, I love that your husband knows things about BDB. I can't get mine to stop rolling his eyes at Twilight (my obsession), although I suppose I understand. Is that bunny the cutest freaking thing I've ever seen??? ROFLMAO @ your hubby! That is funny. Yesterday I was discussing Blay & Qhuinn (*swoon*) with my hubby and he gets all uncomfortable, shifting around and starts mumbling about how he should have stayed at work! LOL! Thats funny about the hubby!!! Giggling about your husband. It sounds like something that would happen at my house. New follower. 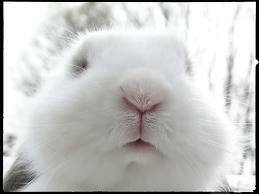 Hiya hopping through from Follow me Friday. My everyday friends don't read much so I talk books to all of my friends at Goodreads, its where I get all my suggestions of what to read next and what to avoid. I would probably collapse in a heap if my husband even knew who Z was never mind corrected me on his shellan!! Hi I'm a new follower from the hop! Your blog design is absolutely beautiful - I'm glad to have found you! Awh that's so cute of your husband! Bless. I know what you mean about the lack of PNR/UF in RL; most people consider what I read to be my little 'quirk'. I reckon that's why there's so many of us in the blogosphere! Happy Friday!!! I am a new follower hopping through...Love your blog and look forward to following. I probably know more people IRL that read fantasy that do in my online book circle! Maybe that's what comes from socialising with geeks :) I read lots of different genres though so I can talk to almost anyone about books (apart from the guy that sits next to me that has read one book his whole life - though he makes an effort to ask). I loooove Strider! Even though I haven't read The Darkest Secret yet. I'm glad you have people IRL who can talk books with you! I have a couple of friends and they're really great. I just wanted to stop on by for the hop. I started my blog just so I would have somewhere to rant about my love of books. Isn't it great to be able to share this with others? I'm actually luck now that both my hubby and mother have been getting into my books lately. So I get to share with people online and in real life. If you have a chance, please make sure to check out my blog as I have two giveaways running. Thanks! A Book Obsession..
My daughter recently made me read "Never Let Me Go" as soon as I closed it she dragged me in her room and we threw ideas back and forth. It was so much fun to really dive into a book with someone else. I probably "talk" more to other bloggers about books than I do my friends. Happy Blog Hop! (I know I'm a little late this weekend) Old follower here! I'm happy to have my blogger friends too! What would I do without them! F.Y.I - We are celebrating our one year anniversary at Once Upon A Chapter and have some awesome giveaways on! Please stop by!